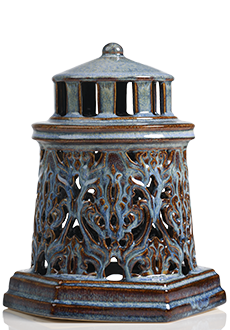 This ceramic shade is skillfully textured and finished to produce an abstract shade of denim blue with contrasting brown trim. The detailed design cutouts create a stunning effect when the Simmering Light shines through reminiscent of you favorite lighthouses shining in distant waters. 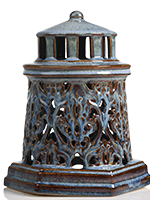 This item has a hand glazed finish making each shade unique. Measures 8” diam x 9.5” h.